Travel day started at 6am when we left for the airport for our 8am flight. One stop in Indianapolis and we were soon off to Orlando. 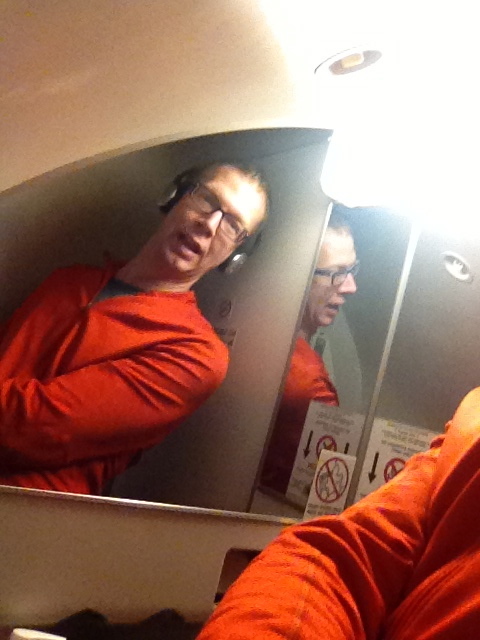 The result of over hydration: the need to use airplane bathrooms. We really had no issues with our flights but the anticipation of the weekend made them take forever! We landed in sunny Florida around 2:00pm. When Flying to Disney World, you have the ability to use the Magical Express. Last time we used this service, it was amazing. You walked to the buses, hopped on, and rode straight to your hotel. They take care of your luggage for you. Stop staring at me. I'm just taking a picture. This was the sign of times to come. We probably waited around 45 minutes for a bus. I was hoping to be close to the hotel by this time because I wanted to spend as much time as I could at the Expo. Once we arrived at the hotel, the fun really started! If you remember back when I first started talking about this in May, this trip was being planned with Jill (a friend through work), Rebecca (TKB's brother's wife), and finally Joe VI & clan. 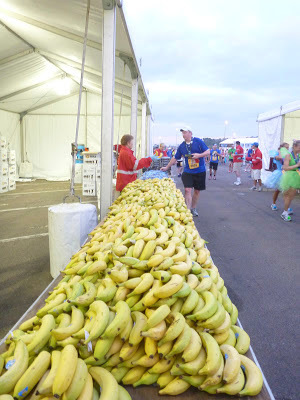 All in all, we had roughly 18 runners and athletic support crew descending on Orlando. One thing about Jill... we'd never met in person. Even though we talk over the phone, IM, Facebook, Twitter, text, etc... we've never met in person. Would she get tired of having to stare up at a 6'4" person all weekend? What about her friends? Maybe they wouldn't understand my dorkiness? What if TKB couldn't stand their accents?! This might get real awkward, real quickly considering we all had adjoining rooms at Pop Century! Fortunately, we didn't skip a beat! We hit it off with Jill and Ron immediately.. whew! Ronnie! Mentally preparing for his first marathon in two days! We immediately took off for the Expo. 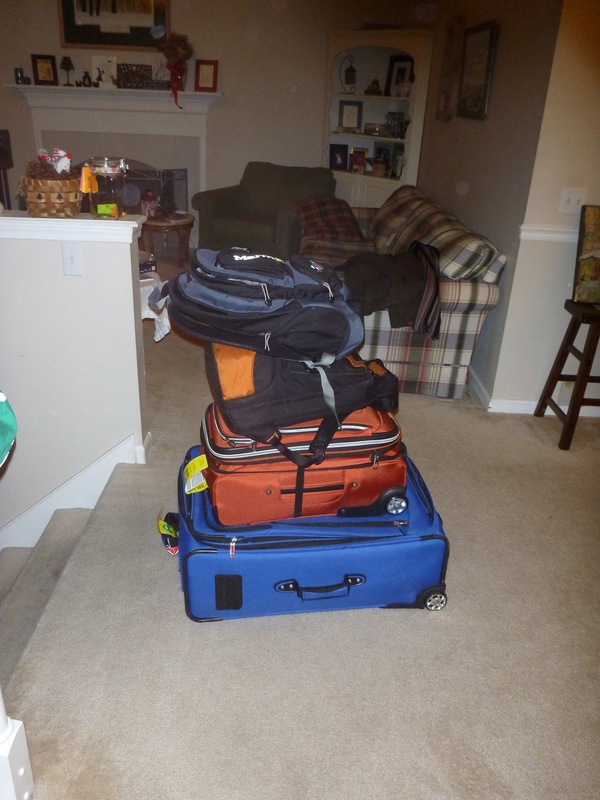 Jill and Ron had already taken care of business since they arrived much earlier than we did. It was close to 5pm at this time. We had to pickup Joe VI, Lauren, and Joe VII's packets since their flight was arriving later. Joe VI was running the 5k with TKB, Jill, and me so I wanted to make sure he could get his bib. Packet Pickup and Expo was in the Wide World of Sports Complex. First stop was in one of the field houses to pickup the packets and change corrals, if needed. You them move over to another building for race shirt pickup and wallet thinning. It had taken about 1.5 hours to do packet pickup with all the lines and various packets we had to sign for (which was about 7 of them between the two families). We had met up with Joe VI's clan by now. At the Expo I did pickup another shirt, running hat, and my obligatory pint glass. Panorama of the Expo. Doesn't really do it justice. For the amount of people this was a really small space. About 6:45 we took off because we had reservations with Jill and her crew at Planet Hollywood in Downtown Disney. Since we had one hour to take a bus back to our hotel then hop on one for Downtown Disney, we decided to take a taxi instead. Considering all the free transportation, this wasn't the most fiscally-wise decision but there is no way we would have made it in time. Look at all those waters. We are such good, responsible runners. I can't exactly remember what time my alarm went off but it was earlier than anyone else wanted. I scarfed down a bagel and banana. I donned my blue singlet and running shorts for today's run. It was so weird to be wearing a singlet in January! Upon checking into our Pop Century resort, they indicated that there would have some parts of the food court open early so we took off for the main building before making it to the event buses. We quickly found out that the early opening was for Saturday and Sunday during the marathon events, not the 5k. TKB had some oatmeal she was planning to warm up so I ran that back to the room. Got my warm-up run in! (2 hours early...oh well). After about 1.5 hours of waiting, the rest of the 10,000 participants showed up and we were herded into one of four corrals. I don't know how they assigned them, but the four of us were in all the same corral (luckily, corral A). 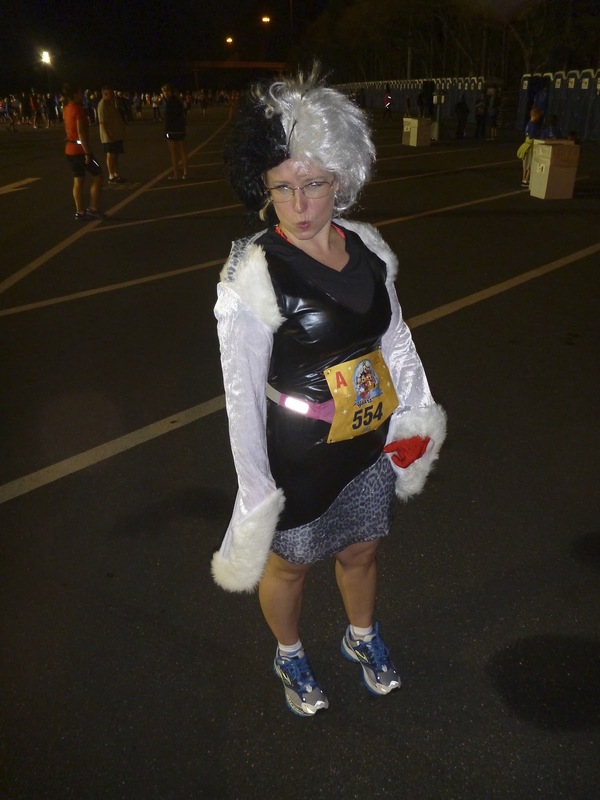 The race started at 6:30am to Mickey Mouse and fireworks! 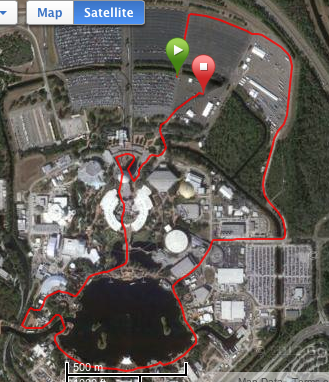 It started in the parking lot of Epcot and the first mile took us around the a service entry into the park. 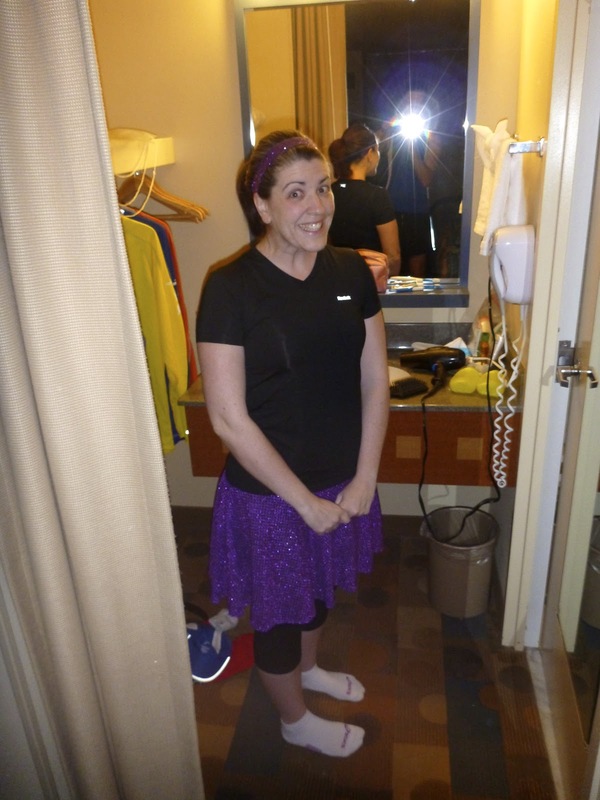 We then ran clockwise around the countries of Epcot. We did briefly exit the park and back in before making it under Spaceship Earth. 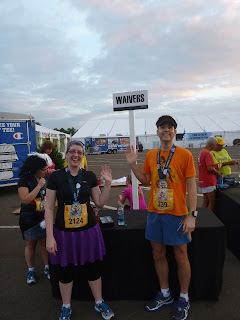 We all stayed together to take photos (most of which were kind of blurry due to the pre-dawn timing of the race). The last photo of Jill is about .15 miles from the finish line. TKB and Joe VI didn't stop for the photo, so as soon as I snapped this photo I booked it to catchup with TKB. 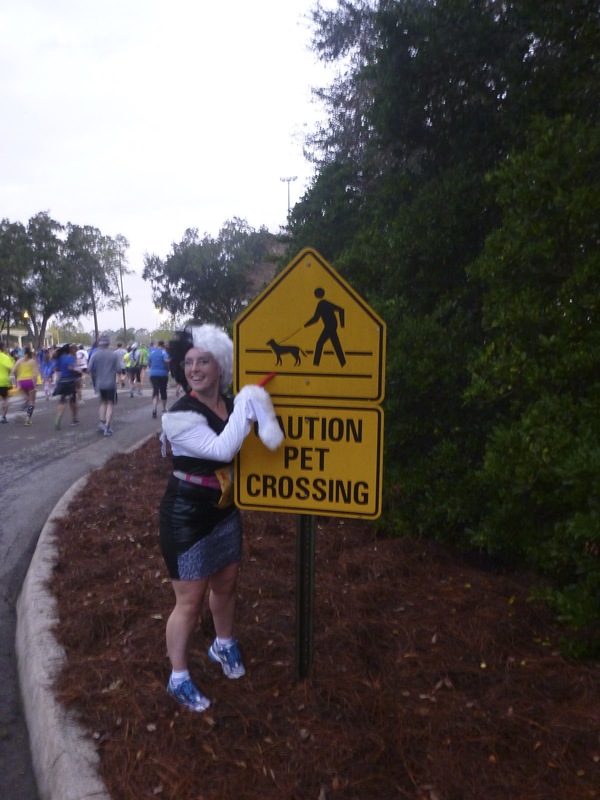 I was hoping to cross the finish line with her. Once I saw her kick it to the finish, I knew it wasn't possible... even though I hit a 4:40 pace! Next time! High performance gummy bears (in blue) and box-o-goodies. Inside the box was a protein bar, mixed nuts, dark chocolate, some chocolate turd thing, and crackers & cheese. Those crackers and cheese were quite sought after. I may have stolen someone's in the middle of the night and eaten them under the covers with the guilt of a two year old. Before we knew it, we were back at the hotel cleaning up and resting for the days festivities. NOTE: No official time for the 5k. It wasn't chip timed. Some pasta carbonara thingy. Yum! After dinner we went back to our resort and met another member of Jill's crew. Jess had arrived today and she was running the marathon on Saturday. Our marathon wolf pack grew by one. Eyeing Dalmatian costumes in the crowd. Up Next: Saturday -- Half Marathon. To PR or Not to PR. Stay tuned! Also... be sure to checkout Jill's blog for her race/spectator reports!